It is not just the Saudi king who will be skipping this week’s Camp David summit of US and allied Arab leaders. Most Gulf heads of state won’t be there. US President Barack Obama had invited six Gulf kings, emirs and sultans to the presidential retreat at Camp David, seeking to shore up wavering trust while Washington negotiates with regional power Tehran. Obama’s plans now lie in tatters, with only two heads of state slated to attend the Thursday meeting. Saudi Foreign Minister Adel al-Jubeir announced late on Sunday that newly installed King Salman will not be attending. The ostensible reason was because the upcoming summit on Thursday coincides with a humanitarian ceasefire in the conflict in Yemen, where a Saudi-led coalition is fighting Shiite rebels known as Houthis. Crown Prince Mohammed bin Nayef, who is also interior minister, will lead the Saudi delegation and the king’s son, Deputy Crown Prince Mohammed bin Salman, who is defense minister, will also attend. 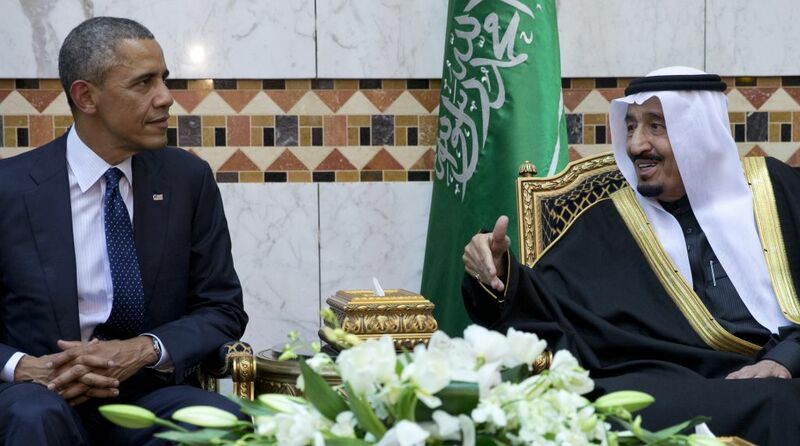 Obama had planned to meet King Salman one-on-one a day before the gathering of leaders at the presidential retreat. The king, who took power in January after his brother King Abdullah died, has not traveled abroad since his ascension to the throne. The tiny island kingdom of Bahrain said separately that its delegation would be headed by the country’s crown prince, Salman bin Hamad Al Khalifa. Bahrain, whose leadership has close ties to the Saudis, is an important military ally of the US. It is the longstanding host to the Navy’s 5th Fleet, which is responsible for operations around the Arabian Peninsula and northern Indian Ocean, and is Washington’s main naval counterbalance to Iran. At the summit, representatives of Gulf nations will be looking for assurances that they have Obama’s support at a time when the region feels under siege from Islamic extremists and by Iran’s rising influence. The Gulf states worry the nuclear pact taking shape with the US, Iran and other nations may embolden Tehran to act more aggressively in the region. Israeli Prime Minister Benjamin Netanyahu has expressed similar concerns, saying the emerging deal will leave too much of Iran’s nuclear infrastructure intact while giving it quick relief from economic sanctions. Netanyahu has been an outspoken critic of the deal, raising tensions with the White House. US attempts to reassure Israel that the deal will have strong safeguards have done little to ease its concerns. Netanyahu has claimed that moderate Sunni Arab countries see “eye to eye” with Israel on the matter, though he has not elaborated. Obama has indicated he will not meet Netanyahu before the June 30 deadline for the Iran deal. Abdulkhaleq Abdullah, a professor of political science at Emirates University, said Gulf leaders were staying away from the Camp David gathering to signal their displeasure over the nuclear talks. The sultan of Oman, Qaboos bin Said, is among those staying away. The sultanate will be represented instead by the deputy prime minister, Sayyid Fahd bin Mahmoud Al Said, and other officials, the country’s official news agency announced. The sultan’s absence comes as little surprise. The long-serving monarch, whose country maintains cordial relations with Iran and has served as a go-between for Tehran and Washington, returned home in March after spending several months in Germany being treated for an undisclosed illness. Crown Prince Sheik Mohammed bin Zayed Al Nahyan, the president’s half-brother, held talks with Obama at the White House last month and is expected to lead the Emirati delegation. Abdullah, the Emirati professor, said the Gulf ties with the United States remain strong, but they have been strained during Obama’s tenure. “You just pre-empted the whole meeting with this kind of statement,” he said. Also, Qatar’s emir, Sheikh Tamim bin Hamad Al Thani, is scheduled to depart Monday to take part in the meeting. As late as Friday, US officials had said they had expected Saudi King Salman to come to Washington, before learning of the change in plan. “This is not in response to any substantive issue,” insisted one senior US administration official. Gulf officials have been pressing for the United States to supply advanced weapons like F-35 stealth fighters as well as a written security guarantee in the face of a threat from Iran. “I think we are looking for some form of security guarantee, given the behavior of Iran in the region, given the rise of the extremist threat,” said Yousef al-Otaiba, the United Arab Emirates’ ambassador to the United States. A high-level Saudi official told The Associated Press in Riyadh that his country wants a defense system and military cooperation similar to what the US affords Israel. The official said they also want access to high-tech military equipment, missiles, planes and satellites, as well as more technology and training cooperation with the US. A US official said a key part of the meetings would be to support a common Gulf defense infrastructure. “This focus on mutual security extends to various areas -– counterterrorism, maritime security, cybersecurity and ballistic missile defense,” the official said. Washington and the Gulf nations are also expected to discuss conflicts across the Middle East including in Iraq, Libya, Syria and Yemen. The New York Times reported 10 days ago that Israel’s military edge might be at risk as Obama “scrambled” to placate Arab fears on the Iran deal. It said the US could sell F-35s to the UAE three years after Israel gets them, and might offer Gulf allies defense pacts, joint training, upgraded status.